Situations in which you want to learn how to strengthen the foundation of the house, fortunately, are quite rare. 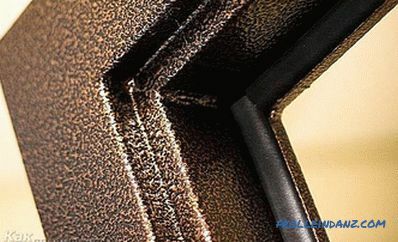 However, when faced with a similar problem, most building owners do not know what they need to do and whether they will cope with it on their own. 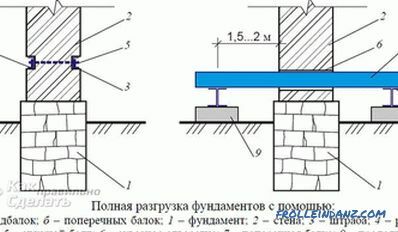 gradual immersion of the entire structure or part of it into the ground without cracks - the cause This problem was most likely the wrong calculation of the width of the bottom (cushion) of the foundation, and therefore it began to smoothly sink into the ground below the planned level. Thinking how to strengthen the foundation of the house, it should, first of all, establish the cause of the apparent destruction of the structure. 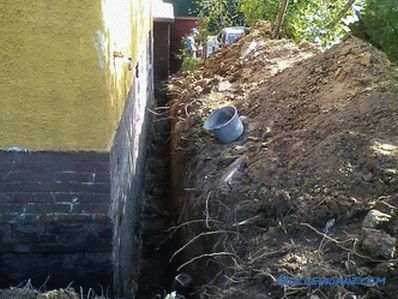 This can be done only in one simple way - by digging up the damaged part of the foundation. 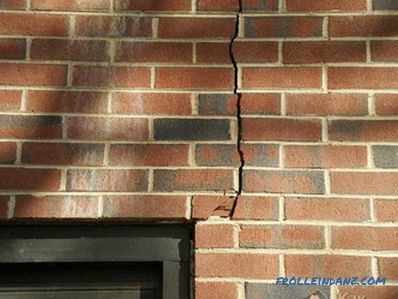 If the foundation does not go deep into the ground (that is, its lower plane is in line with the rest of the foundation), then you will most likely find damage in its very “body” (cracks, grooves that have become visible frames, etc.). This result becomes possible in one case - the foundation was subjected to long-term exposure to groundwater and was not protected from them. 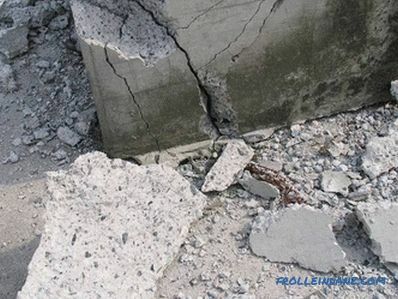 In addition, there is another reason for the destruction of the foundation “body” - swelling of the soil . This happens as follows: if in your area in winter the ground freezes to a rather great depth, and the foundation was not deep enough, then the water under its sole turns into ice when the temperature drops. As you remember from school lessons, ice has a greater volume than water, which is in its liquid form. Therefore, the ice particles begin to act on the base of the foundation, pushing it up, and on the other hand, the weight of the building presses against the foundation. As a result, it does not withstand such a compressive effect, alternating in spring with soil thawing and the formation of small voids, in which the building, under the influence of its weight, begins to slowly fall. If you have questions about the depth of the foundation (it should be at least a little more depth of soil freezing in your area) it is recommended to contact the local architecture - there the experts will look at their maps and inform you of the necessary parameters. 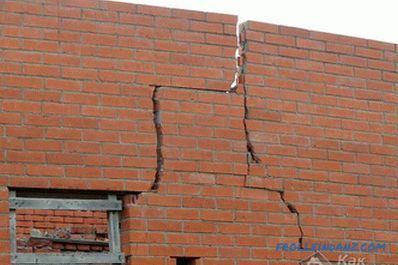 If the foundation fell into the ground under the influence of the weight of the building, then you will see a gap (vertical crack) in the “body” of the strip foundation or one column overly deep (if your building was erected on a columnar foundation). Deciding how to strengthen the foundation of the house, you first need to determine whether you can handle this problem yourself. 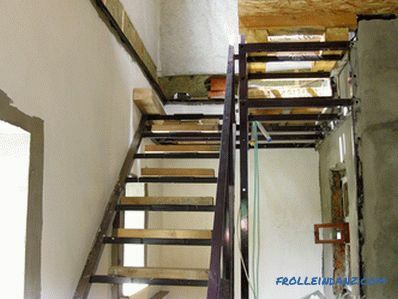 If your building has more than one floor or its walls are lined with heavy materials (such as a brick or block), then it is better to immediately contact the firms specializing in these works. Such buildings weigh too much, and in order to strengthen the foundation, in some cases, you will have to raise the building in order to return it to horizontal slabs. and a new foundation is erected in its place. 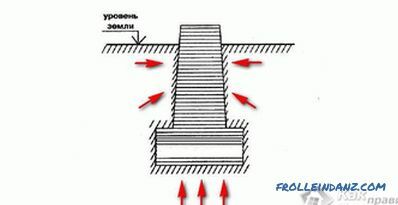 At the same time, the strip foundation can not be changed, but strengthened, The bay next to it is another "foundation" so that under the lower plane of the old foundation there is a "pillow" that makes up a whole with the new "foundation". Both designs (both old and new) must be interconnected by reinforcing rods. Raising the structure so that its weight does not put pressure on the repaired part of the foundation, to concrete under it the “missing part” is the foundation “pillow” (such an operation will require special equipment, but if the building is small, then you can first dig a trench around the perimeter, gradually digging out the space under the foundation and filling it with concrete). 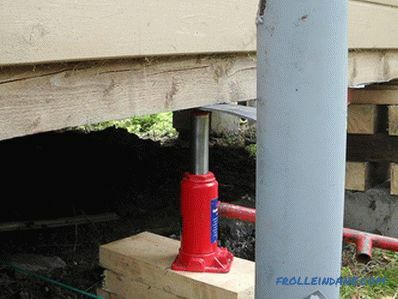 If this is difficult to do, then you can use the method described above to build a "parallel" foundation. A new blind area with an internal heat-insulating layer should be laid along the perimeter of the building. Its width should not be less than 1 meter. 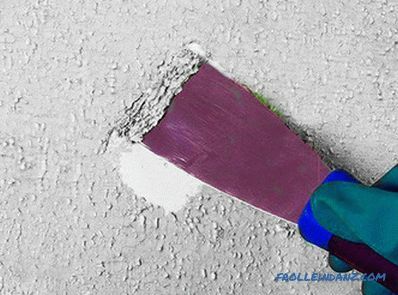 And do not forget to protect the repaired foundation from the effects of groundwater, causing a waterproofing composition on its vertical surfaces. 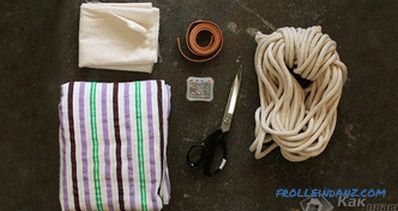 how to fill the strip foundation with your own hands.